One of my projects is featured in this spring issue of Stitch. 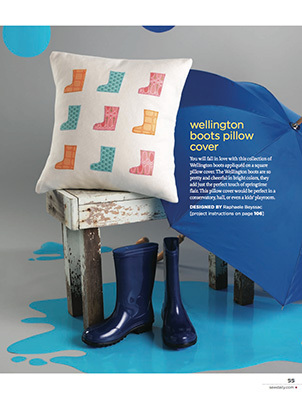 I explain how to make a pillow cover with wellington boots machine appliqué. My tutorial is in the Spring Rain section along with a fabric purse, a rainy day jacket and even a puppy poncho. This issue also features other cool sewing projects I would try myself. Among my favourite are: rice eye compress, cozy slippers and sashiko-embroidered yoga pants. The magazine is available in digital edition and can be found here, if you want to take a look. Thanks, yes it is pretty exciting. I love to see how my pillow looks on a professional picture.